Although it’s located in a suburban area, our San Fernando Valley hospital does not shy away from the action! We’re open 24/7 for emergencies and offer specialty services for cardiology, internal medicine, surgery, and neurology patients during business hours. 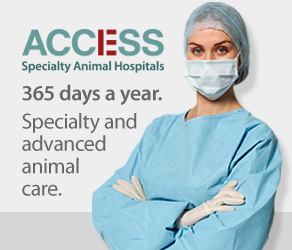 Add in our state-of-the-art medical equipment and we’re the obvious choice for animals in need in the Valley! Our hospital is at the corner of Ventura and Winnetka, minutes away from Pierce College, a school that hosts a prestigious Veterinary Technician program, making the San Fernando Valley the place to be if you’re interested in working in the veterinary field! We’re also conveniently located across the street from several restaurants, coffee shops, and a grocery store, which adds to the accessible comfort for our staff and clients.